Greg Hodnett used a late race bobble of Adam Carberry to take home the Turnpike 25 win Tuesday night at New Egypt Speedway. 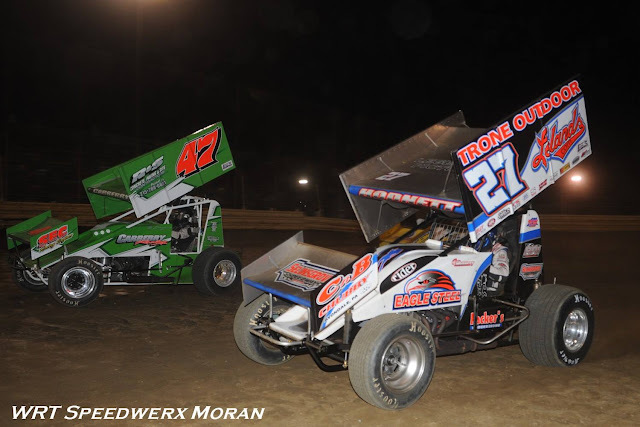 With 19 cars in attendance for the 4th annual Turnpike 25 presented by Brett Deyo, the two heat races went to the Heffner owned 27 of Greg Hodnett and the Carberry Racing, R&S Concrete and Paving #47 of URC Rookie Adam Carberry. When the #0 pill was drawn by Hodnett the feature was a heads up start. At the drop of the green flag it was the 47 of Carberry jumping out to the lead. A lap 1 red flag found the Quality Auto Body #89 of Robbie Stillwaggon on its lid after contact with a spinning Ed Aikin coming off of turn 2. Once the 89 was cleared to the infield, Carberry used the inside lane on the double file restart to once again take command of the lead for the 25 lap feature. By lap 5, the 47 of Carberry was dealing with lapped traffic until a lap 9 caution came out for the 21k of Kyle Reinhardt who had been running inside the top 10. Reinhardt was taken to the pits and did not return. With just under 10 laps complete the running order was Adam Carberry, Greg Hodnett, the Pioneer Pole Buildings #747 of Davey Sammons, the Victory Auto Glass #63 of Josh Weller and the 28f Franek Auto Sales of Davie Franek rounding out the top 5. A lap 10 restart saw Carberry take command of the lead once again, however on lap 15, Carberry and the 47 jumped the cushion letting the 27 of Greg Hodnett to take control of the lead. That was all that Hodnett needed as he lead the remaining laps to take home the 25 lap feature win along with the $2,000 winners prize money. Heat races were won by Hodnett and Carberry. Heat 1 pole sitter Troy Betts experience a scary moment when he briefly had to deal with a cockpit fire, Betts quickly exited the B&G Auto #22 while still engulfed in flames. Thankfully a quick thinking corner worker threw dirt on Troy as he was laying down rolling around trying the extinguish the fire himself. Other URC Rookie Justin Whittall had a strong 8th place run in the Pioneer Auto Body #67. Unfortunately due to the lateness of the races, race winner Greg Hodnett needed to head out before victory lane could be completed at the end of the night. The United Racing Club will be back in action on Friday night in coal country as they visit the Big Diamond Speedway. Pit gates open at 5:30, hot laps at 7:45 and racing begins at 8:15. Last years winner Josh Weller will be looking to repeat in his family owned #63.